Deanne Lenehan is not your stereotypical artist. From her years as a high school art teacher she learned the importance of organization and effective communication. These, coupled with her talent and drive, have been the reason why Lenehan Studios has served clients in the Baltimore Washington metro area for nearly 20 years. Not sure how to make a living as a fine artist, Lenehan decided she would become an art teacher like her grandmother who had nurtured her talent from an early age. During her first year of teaching a friend requested mural for her daughter’s room. She loved being able to paint and get paid for it so she was sold immediately. With her fine art background and entrepreneurial spirit she created her decorative painting business in 2001. 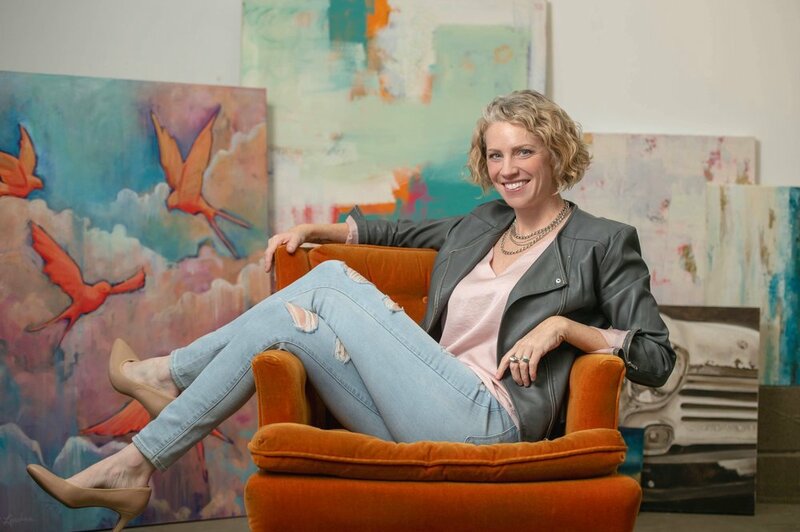 She earned her Bachelors of Science in Art Education at Towson University and as studied at Pratt Institute, McDaniel College and has had the fortune of being able to study nationally as well as in Italy and France, under the tutelage of the industry’s top artisans. Her work has been seen in over a dozen designer show houses and she is the first decorative artist to have a course on decorative painting accredited by the Interior Design Continuing Education Council. She is the president of the local chapter of the International Decorative Artisans League, founder of the Ellicott City Arts Coalition, and an Industry Partner of the American Society of Interior Designers. In 2008, after 8 years of teaching, she made her side-hustle her full time job. Since then, Lenehan Studios has earned several accolades including heading a team of 30 artists to work on an episode of “Extreme Makeover: Home Edition”, was voted “Baltimore’s Best” Decorative Artist by Baltimore Magazine, and has had her work published regionally including Baltimore Magazine, Howard Magazine and Home and Design. Lenehan was honored to worked with the Baltimore Ravens Foundation to create a series of murals for an elementary school media center renovation. Lenehan Studios specializes in unique and innovative painted solutions for interiors which include faux finishes, murals, custom fine art, furniture and cabinetry repainting. She has most recently launched a collection of fabrics and wall coverings under the name LS Home. She loves to collaborate with interior designers and clients alike to create unique and beautiful spaces that will be enjoyed for years. Lenehan has served clients across the mid-Atlantic and loves to travel wherever the project may take her. Nope, definitely not a robot.